Next: Next post: Read Love Train for free with Amazon Prime! Barbara Fleming writes from personal experience with her book, The Backwards Buddhist: My Introduction to Dzogchen. Here she talks about a variety of marketing techniques and why she would choose to only self-publish. The beginning of the writing process was a challenge to write a book in a month. The story, of necessity, was autobiographical so that it required no research. Having just completed part one of recreating myself from the ground up by divesting myself of every spiritual thought or preconception I ever had from birth to age 50, it was a logical choice of subject matter. The path I chose was so unlikely for me, it seemed a great example of the improbable becoming true. My premise was I could choose to live in a world created by some perception of how things should be, I could just show up every day ready to embrace whatever arose, or I could experiment with any one of an infinite variety of combinations of the two. Tibetan Buddhism is not the first place most westerners look to find their personal path, but it was mine, so that is what the journey is all about. Finding a path with potential but no map and no fixed destination was my recipe for self-discovery. Setting off on such a quest just because I could, and recording the journey to show the potential, complete with embarrassing pitfalls as well as triumphs, should anyone else want to do so, is the major point of the book. Sales have been surprising. My expectations were zero, so selling a few hundred was quite fine and I continue to sell. The most surprising sales were triggered by the inclusion of my title on a college neuro-science course reading list, the subject being the Brain and Meditation, quite a hot topic these days. 3. You have not sought a traditional publisher. Why? I did not seek a traditional publisher because no one owes me any personal favors. I would only self-publish. If I choose to speak using passive voice, I can do so without guilt. I can say exactly what I start out to say, not what someone else thinks will sell the book. I cannot write what I am not interested in writing. It was the same when I was an artist for almost twenty years. I turned away commissions because I knew I would not be able to complete it according to their view. I once did a painting before making this discovery and it has informed much of how I approach life. The portrait was of a group of beautiful in face children. The children themselves were spiteful, rude and abusive to each other and their caretakers. I completed the painting but never asked for payment. No matter how hard I tried it came out like a page from the Marquis de Sade. I used newspaper interviews, professional reviewers, college connections at William and Mary, blogs, websites, Facebook, Twitter, LinkedIn, Web ring, local book signings, book talks and word of mouth, free copies to key individuals and professional handouts at local bookstores publicizing it. Discontinued bookstores because the local ones are not worth the trouble. If it doesn’t sell on Amazon, I’m ok with that. I have MS and no energy to promote what has already more than satisfied my hopes. How happy I am I did not need to write for a living. Skip the website and go straight to a lean clean blog site, post comments everywhere and enjoy it. Also – at a book signing, remember I went there to sell books, not teach. I was having so much fun answering questions the library closed and I never even had a chance to sign a single copy. I did have over 30 people in a small town in Maine in winter. I’m an “awayer” so it wasn’t because they knew me. My advice is worth less than two cents, but enjoying your experience is the one thing I would hope for every author. Currently I am writing daily on my blog, Backwards Buddhist Part 2. Catchy title don’t you think? The Backwards Buddhist affirms Dzogchen is more fun. 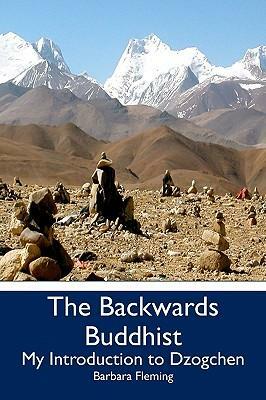 Visit Amazon.com for Backwards Buddhist – My Introduction to Dzogchen, available in both e-format and hard copy. Signed copies available from me on special request. Or visit my blog.